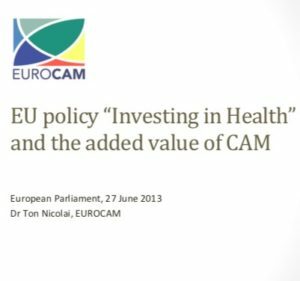 On 27 June 2013 a Joint Meeting of the European Parliament Interest Groups MEPs Against Cancer and MEPs for CAM was held, entitled "CAM: An Investment in health", alluding to the Commission Staff Working Document "Investing in health". Across the institutions of the EU there is general agreement that the EU is facing a growing health crisis. A combination of an aging population, rising levels of chronic diseases such as cancer, diabetes and heart disease, a growing burden of mental ill-health and the challenge of anti-microbial resistance are all underpinned by the impact of the strain of austerity on healthcare systems. Such a situation begs the question as to whether there are ways to approach healthcare other than the current disease-focused, pharma-based model that seems to cost ever more to provide. It was in this context that the conference took place. About 60 guests attended the CAM-MAC meeting, including MEPs and delegates from the Commission and other European institutions, as well as health professional and Non-Governmental Organizations. The conference was co-hosted and chaired by Alojz Peterle MEP (Slovenia), himself a beneficiary of CAM treatment for cancer, and Sirpa Pietikäinen MEP (Finland). Following Commissioner Borg’s opening address the conference heard presentations from range of expert providers and researchers on the growing popularity of CAM with citizens and patients, what characterises the holistic approach of CAM to patient care, various aspects of the current provision of CAM in the EU and the potential benefits of its integration into health systems. As far as the regulatory status of CAM providers across the EU is concerned the situation is completely heterogeneous. There is little coherence in the way member states regulate the estimated 150,000 medical doctors providing CAM, 150,000 nurses, physiotherapists, pharmacists and vets or the 150,000 CAM practitioners practising CAM in the EU. Equally challenging is the situation on the availability of CAM medicinal products. Member states’ implementation of EU directives for traditional herbal and homeopathic medicinal products is again variable and incoherent often impacting negatively on access to these medicines by citizens and CAM providers. Other speakers presented recent studies on the economics of CAM. These studies seem to support the proposition that its widespread use and integration could potentially result on cost-savings for health systems. One study in particular that involved ‘mining’ the large data-base of Dutch health insurers, appears to show that patients of GPs who use CAM in their practices live longer healthier lives and yet cost less in overall care, mainly due to reduced pharmaceutical use and reduced secondary referrals. Evidence for effectiveness and cost-saving was also presented from the pioneering health service in the Tuscany region in Italy where the widespread integration of CAM across hospital-based healthcare services is having a positive impact on patient care and showing early evidence of cost reductions. The Tuscany Region is actively involved in the EU European Partnership for Action Against Cancer (EPAAC) and brings the contribution of CAM in the complementary care of cancer patients to the project discussion table. In their closing remarks MEPs Peterle and Pietikäinen called for the potential contribution of CAM to healthcare in the EU to be taken more seriously by the EU Commission and Member States. They specifically called for the EU to invest more in researching the effectiveness and cost-effectiveness of CAM and to take action to resolve the highly confused and inhibiting regulatory situation that currently exists for products, providers and patients. Keynote speech by Commissioner Tonio Borg. Ms Solveig Wiesener, Senior Adviser, NAFKAM, University of Tromsø, Norway. Mr Stephen Gordon, MCH RSHom FSHom, General Secretary, European Central Council of Homeopaths, UK. Mr Nand De Herdt, President European Coalition on Homeopathic and Anthroposophic Medicinal Products, Belgium. Mr Seamus Connolly, President European Federation for Complementary and Alternative Medicine, Ireland. Dr Erik Baars, Professor of Anthroposophic Healthcare, University of Applied Sciences, Leiden, the Netherlands. Dr Elio Rossi, Tuscany Regional Network for Integrative Medicine, Italy.